Researchers at the Aberdeen Maternity Hospital (Scotland) recently published a study in BJOG on a possible correlation between hemorrhage and altered fertility. The hemorrhage does not appear to be the contributing factor to infertility. Data collected between 1986 and 2005 were used for the study. Data was held at the Aberdeen Maternity and Neonatal Databank. Of the nearly 35,000 first pregnancies researchers pulled, about 10% experienced PPH during the first pregnancy. Contributing factors for PPH include smoking, increased maternal age and being overweight or obese. After the initial pregnancy women were followed for five years. Some women conceived a second pregnancy during this time and others did not. Researchers noted that women who experienced PPH conceived a second pregnancy within five years at a rate comparable to women who did not experience PPH. However, when method of delivery was taken into consideration, the rate of pregnancy changed. About 37% of the C-section/no PPH population did not conceive within five years. That number rose to nearly 42% for women who experienced PPH following a C-section during first pregnancy. Women who experience PPH during first pregnancy and deliver vaginally do not appear to be at increased risk of future fertility problems, but that may not be the case for women who deliver via C-section. 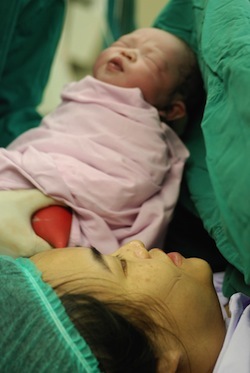 Additional research is needed to replicate findings and further study the connection between C-section, PPH and reduced fertility. Experiencing PPH is a frightening complication of pregnancy that may leave women worried about future pregnancies and impaired fertility. This researched showed no negative side effects on fertility for women who delivered vaginally, which may bring some peace to the minds of women in this medical situation. Source: G Fullerton, PJ Danielian, S Bhattacharya. Outcomes of pregnancy following postpartum haemorrhage. 23 Jan 2013. DOI: 10.1111/1471-0528.12120.